Third time is not just a charm; it's a way of life for the 81st Regional Support Command Safety Office. The 81st RSC has won the Army Reserve Commander's Excellence in Safety Award for a third year in row. Dan Heath, Chief of Safety and Occupational Heath, credited his staff, teamwork and a focus on safety for their success. "This award is a reflection of our commitment to safety and it's a product of the due diligence of our safety specialists and our employees at all of our facilities." For Heath, winning safety awards has been a way of life. 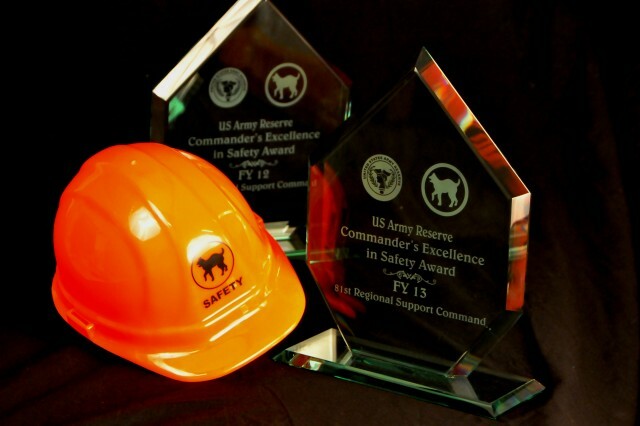 In a previous assignment as the Safety Manager for the 89th Regional Readiness Command in Wichita, Kansas, he and his team claimed the award three in a row. He brought this experience to the 81st and incorporated much of what he learned into the safety plan. "We work with our employees at our (maintenance) shops to assist with safety programs. We are a full-service safety office, "Heath said. The RSC received the award based on a commitment to best practices and safety record. The award criteria includes number of accidents, inspections, completed Composite Risk Management training, Additional Duty Safety Officer and Commanders Safety Course training, and other unit-driven programs, like the Motor Cycle Safety Course. The 81st safety team visits every facility in the RSC's system (247) and they inspect every facility the Command owns or leases (190) annually. Tameica Turner, Senior Safety Occupational Health Specialist, submitted a packet for the award this year hoping to recognize the success and commitment of the teams' members. "This is a hard-working team that strives to be number one. They are on the road non-stop, away from their families, missing out on a lot of things. They deserve this award. They make a lot of sacrifices. When given the opportunity, I thought they should be recognized. " Chief of Army Reserve LTG Jeffrey Talley will present the award to 81st Commanding General MG Janet Cobb and CSM Ronald Law in the spring. Turner said that is fitting that the leadership gets to receive the trophy. "We get a lot of support from our senior leaders. They are 100 percent behind us. All of our Directors sit on our safety council. If you don't have that, it is very difficult getting the resources you need."